Place value can be a challenging concept for early learners just starting to group ones into tens and tens into hundreds. iGet Math: Base 10 gives students space to explore counting, addition and subtraction. Kids can count and combine objects, alter equations and notice relationships between numbers. This app is a great choice for kids developing an understanding of counting and cardinality, as well as foundational number sense and operation skills. 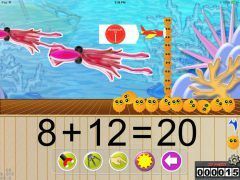 iGetMath: Base 10 lets kids flick and pick up objects to move them across the screen to change the balance of an equation. Children can customize the backgrounds and tap the screen to hear a number as they count blocks. This app addresses Common Core State Standards, contains eight skill levels to choose from, and lets teachers see student progress. Learn more about iGet Math: Base 10 by watching this video or visiting their website!